This installment of the elmcity+azure series shows how curators can find and publish events that are discoverable online, but not available in a structured form that can syndicate in and out of one of the elmcity hubs. When a curator signs up for the elmcity calendar aggregator project, the first question is invariably: OK, where do I find calendars? Although the service aims to gather and republish iCalendar feeds, there’s a chicken-and-egg problem: The vast majority of calendar information on the web is implicit, not explicit. This project is all about finding a lot of that implicit data and making it explicit. One great asset for calendar curators, as I’ve mentioned before, is FuseCal. I’m using it, for example, to turn this poorly structured page at the Keene Public Library into an iCalendar feed that can participate in the syndication network. Curators in Providence, Huntington, and elsewhere are having good success with FuseCal. Many of these pages mention implicit recurring events that a curator can make explicit, by publishing them in a special iCalendar feed. 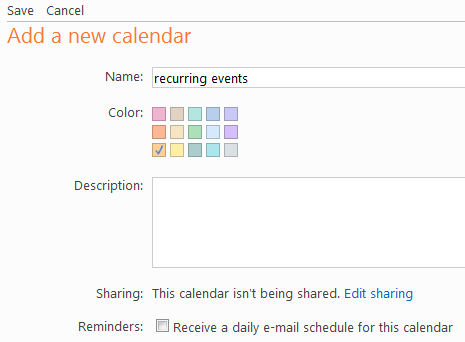 Since I’ve already shown how to publish iCalendar feeds using Outlook, Google Calendar, and Apple iCal, I’ll add a fourth example to that series and show you how to do it using Microsoft Live Calendar. Let’s look at search result #22, September08newsletter.nws. 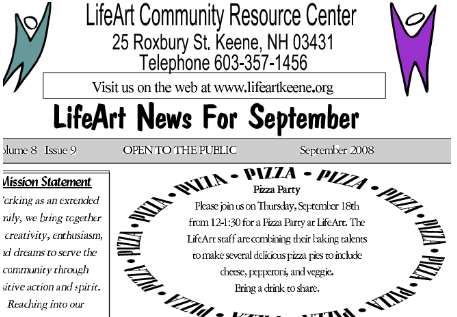 It turns out to be a PDF newsletter from the Keene LifeArt Community Resource Center, whose official events page is under construction. Cheshire County Structured Storytelling: Creating and sharing stories about heroism and humor. Thursdays from 10:45 to 11:45. 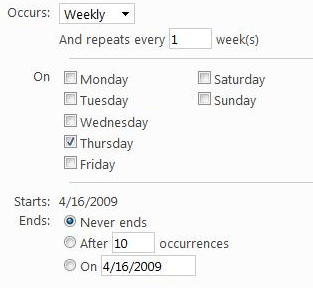 Publishing one of these into an iCalendar syndication network, using Live Calendar, is a two-part process. Part one is a once-only setup of the feed. 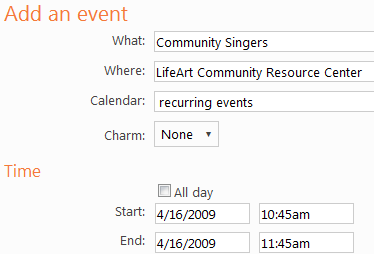 Part two happens once per recurring event. 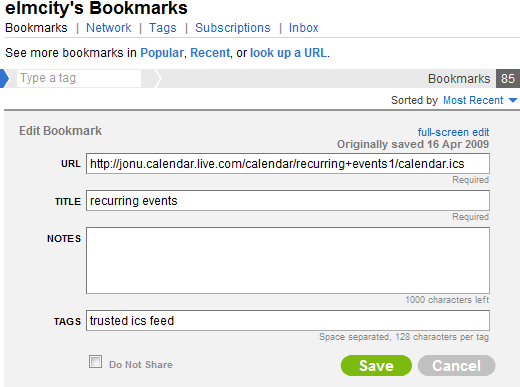 In this case, the link is webcal://jonu.calendar.live.com/calendar/recurring+events1/calendar.ics. Change webcal: to http: and use these three tags: ics, feed, and trusted. Use the best link you can find for the organization, group, or individual sponsoring the event. Anyone who discovers the event at the hub, or in any feed that comes from the hub, will follow that link to find out more about the sponsor and the event. Because there’s a high payoff. You could publish an individual event this way, but once it scrolls past the event horizon it’s gone. When you publish a recurring event, though, you’re creating a gift that will keep on giving. Why should a curator have to do this?